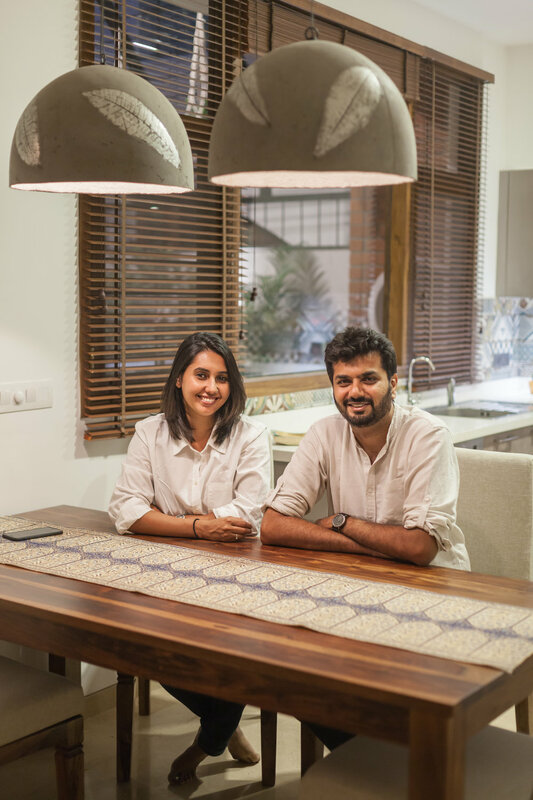 1leapingfrog studio was founded by architects Bhyrav B.R and Aatira L. Zacharias, alumini of The University School Of Design, Mysore; soon after their marriage in 2012, extending their successful partnership into the work sphere. Couple of years down the line, we remain a small studio practice with some good work under our belt and exciting prospects lined up before us. Still in our infancy, we are driven largely by our curiosity and a sense of wonder that space-making has enabled us as designers. In the handful of projects that we've completed, we have tried to be brave, bold, young and most of all, honest - to the brief and our clients. Of course, the burden of practice is upon us all, but we have tried to shed this weight. As a teacher of ours once said, “leave the baggage outside the door” - it was the best advice we ever got. ‘Space’ remains a magical notion for us. We try to treat it without bias, giving each idea a chance to evolve into something larger than who we are. We bring to each project our collective consciousness - poetry, music, food, movies, art, travel, love, loss, memories, friendships and life itself. These have been our inspirations, especially in those moments of turmoil that haunt any designer, young and old alike. We would like to be known as people who come up with good ideas and then oversee execution to perfection, be it for a building or a city, a living room, a backyard, or just about anything. That is after all, the underlying thread that connects us all - the seduction of a good idea! Our brief foray into interiors and architecture has taken us back and forth through several endearing moments - from the atmospheric to the subtle, from the bold moves to work tempered by restraint. We are still oscillating between so many emotions that will craft our spaces as they do, us. We only hope we don't stop making mistakes, taking risks and living with doubt, because they are as important to a young studio as they are to a child.